Sets the drawing gradient to have a box shape. x, y, Width, Height The location of the gradient box. 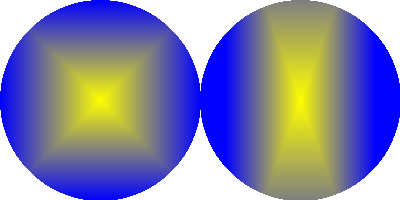 The gradient ranges from the current background color at the center of the box to the current front color at the edges of the box. Additional colors can be added to the gradient with the GradientColor() command. Note: This command only has an effect with ImageOutput() and CanvasOutput(). The gradient only affects the drawing commands when #PB_2DDrawing_Gradient is set with the DrawingMode() command.